Multiphysics simulation is well established in most product development environments and systems. 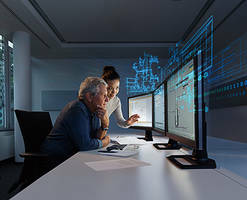 Leveraging this advanced simulation technology for the process industry is one key to the digital twin of your production. Moreover, understanding your system better on a physical level gives you the competitive advantage to get to the market faster and more efficiently. You gain the ability to analyze the interaction of multiphysical domains, including mechanical, hydraulic, pneumatic, electrical, thermal and controls. Also, you can analyze the energy efficiency of subsystems such as electrical machines, pumps and fluid networks which require validations to evaluate various scenarios, such as choosing the correct control strategy. Think of the failures you can thwart by knowing when and where problems may occur in the manufacturing process. Imagine the benefits of proactive knowledge that could help you expose possible failures or weaknesses in your system before you begin production. Because of the increasing complexity and diversity of products in manufacturing, there is a demand for a front loaded engineering and design process. You can’t keep up with all product varieties and updates by building prototypes and testing them. If you’re designing a product, process or system which is a unique fit to a specific customer’s need, there’s no room for failure – and there’s no prototype. It’s crucial to get it right the first time. So what can you do? You can simulate and test your product, system and process virtually, all before you build something physically, using model-based systems engineering. With model-based systems engineering, you capture your system’s behavior before it exists in the real world. This process reveals weaknesses, efficiency losses and critical operating points without risking one of your expensive prototypes. Therefore, you can optimize your system’s behavior before building it and avoid costly changes in the future. Additionally, you save time by reducing troubleshooting and saving money with fewer prototypes and physical tests. The graphical modeling approach allows you to develop an easy-to-understand and reusable model to assist with assessing and validating a system. You can develop complex systems quickly and economically, so being able to comprehend or write the underlying equations of the model is now unnecessary due to predefined physical libraries. Libraries stocked full of physical components assists you in developing your system, saving you time and money. Additionally, the intuitive and extensive analysis functionality helps you increase your understanding of the system, leveraging significant optimization potential and ensuring that the concept of the model is correct. This behavioral model will enable you to ensure the controls of your system are valid before you test them on the real system, allowing you to do virtual commissioning. Running in real-time with your actual component and its lifecycle, you can compare the actual and ideal state of your system. Leveraging this comparison allows you to train your models to serve you in the context of predictive maintenance. The process of model-based systems engineering is already widely used by leading companies, and it’s quickly becoming the epicenter of development. The trend of ready-built models which are licensed to share with your customers is becoming mainstream. They are leveraged by experts and engineers who may not have built them, but consume them to simulate hundreds of variations of a system to find the absolute best configuration. This toolset is relatable to new products when keeping in pace with your competitors. For example, you’re not to act as a supplier to your customer, but a trusted advisor with the ability to simulate your product or subsystem in the context of your customer’s scenario or system. In addition to this, you can provide predictive maintenance to existing parts like pumps, valves or any other mechatronic equipment. You can simulate the efficiencies and deficiencies to not only the current hardware but also the adaptability of any updated hardware that come with system upgrades throughout the lifecycle. Being able to either look into the behavior of one component itself or in the context of the whole system give you and your customers more possibilities of working together on a virtual level and gaining insights of your systems. The ability to simulate real-world scenarios, providing predictive analysis for both product and process, is progressing towards the mainstream in manufacturing. As you see multiphysics simulation’s value play out in meeting customer demands, you can provide crucial value and implementation for successful development – and a fruitful relationship with your customers. There are many areas where system simulation can help you be more efficient right from the beginning of your development cycle. While system simulation can help you most effectively in a model-based development process, even picking out only a few or one area of interest for system simulation will help you tackle your challenges.